This is Wobbly House Lane. The first house has many many rooms to house the large Fitzherbert family. Mr and Mrs Fitzherbert, Goldie Fitzherbert (10 year old girl), Noodles Fitzherbert (8 year old boy) The Twins; Bill and Ben Fitzherbert (not flowerpot men) (Ben is short for Benweena…a girl! both are 4 years old), and Princess Jumblebeans Isabel Fitzherbert (10 month old girl). The Fitzherbert family also have 2 goldfish and a rather tormented old dog, Sir Fartsalot, who happens to nap next door at the house with the round windows. The house with the round windows is currently occupied by a lovely old couple by the name of Mr Price Smith-Howard and Mrs Percy Smith-Howard; they let Sir Fartsalot sleep in the front of the house, near a window, an open window, next to the fan. It’s just a little house but Mr and Mrs Smith-Howard have installed a secret (don’t tell anyone!) slippery slide from the top floor to the kitchen. Mr Price Smith-Howard very much enjoys being called for breakfast every morning. The tall house with the tall windows, well that house has very tall people residing in it. They have long long legs, and long long arms, and long long necks. They are a very funny family, and tell wonderful enthralling stories. They like the colour blue and always wear shorts, even on rainy cold days. Mr Mac and Mrs Mac and the little Mac called Anne live happily in the tall house with the tall windows. The house with the two pointy bits on top, with the two little windows up there, well those two little windows bought light into one bigish room. And in that room lived little Nicholas Pickles. He has red hair and blue eyes and has a pet mouse as his constant companion. His Mum and Dad live on the next floor down, they are called Mr Neil Pickles and Mrs Olive Pickles. When they get mail sometimes it is addressed to NO Pickles. Because some people don’t like Pickles. 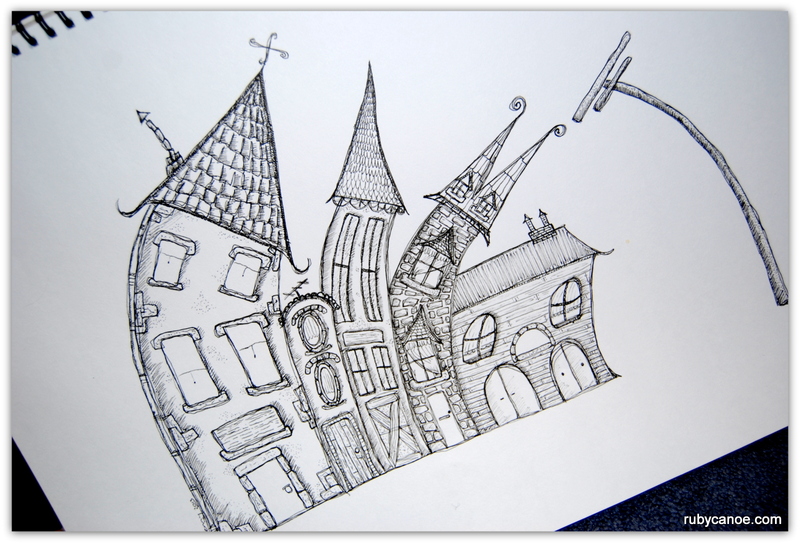 The last house on Wobbly House Lane is the short house. Old Mrs Savoury-Biscuit lives there. She lives in the house with her horse, Fred. Fred is like a seeing eye horse. Which is a sight to see. When she takes Fred to the shops to do the groceries all the kids stare and want to pat Fred, but Fred is busy. Sometimes Fred poops in the middle of the supermarket aisle. So if ever you are in the supermarket and there is fresh horse poop in the middle of the aisle, you may just catch a glimpse of Old Mrs Savoury-Biscuit and her horse and bestest friend Fred. They all love their wobbly houses and their wobbly neighbours. Previous postThe Art of The Pin Up. Next postThe Little Shop On The Corner.